The Bihar School Examination Board (BSEB) is a school board of education functioning under Government of Bihar. BSEB 10th class Exam are starting from 17th March 2015. The Board conducts secondary and senior secondary exams twice a year. Every year, the Bihar School Examination Board conducts Annual Secondary School Examination in the month of February/March. 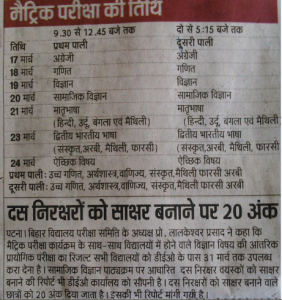 As per the official notice, the Bihar Board Matric Exam Timing will be Commencing from 17th March 2015 and ends on 24th March 2015. Bihar Board is headquartered at the capital city Patna. The history of the Board of Secondary Education, Bihar is excellent with all the academic records. Bihar Board also provides scholarship to bright students. Bihar School Examination Board (BSEB) established for conducting examination for prescribed course of studies at the end of the Secondary School session. 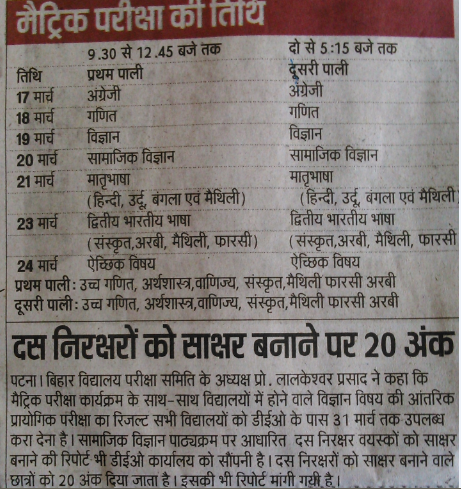 Bihar Board 10th Date Sheet 2015 session is scheduled to be organized in the month of March 2015. There are about 10 Lakhs students appeared for the BSEB Patna 10th exams examination last year. Students who are willing to know their 10th matric Bihar Board result will just have to go to IndiaResults.com and Check official page of Bihar Board. The Supplementary School Examination will be held in the month of August/September on the basis of course/syllabus as prescribed by the state Government. IndiaResults is no.1 results publishing portal in India and IndiaResults will publish the result at their Official BSEB page. We also provide name wise result to the students. Stay tuned for more Updates and Result notifications from BSEB. We will update you with all the latest notifications and results from the Bihar Board.